The call of the Curve-billed Thrasher is a loud, human-like whistle —Whit-Wheet — one of the most common bird calls heard in Sabino Canyon. The Curve-billed Thrasher is a large (up to 11 inches) pale gray-brown bird with a long down curved dark bill and bright yellow/orange eyes. They have large, indistinct round spots on their breast and belly. They are common throughout the year in Sabino Canyon. Pairs stay together all year and spend much of the time on the ground running then stopping to look for food. They forage on the ground tossing leaves and debris aside with their bill to expose insects and other invertebrates. Their diet also includes fruit, nectar and seeds. Curve-billed Thrasher nesting begins in mid-March to early April. The nest is a bulky bowl shaped nest of loosely woven thorny twigs built 3 to 5 feet above the ground, usually in a cholla. The female removes spines from the cholla, close to the nest, in order to prevent accidental stabbings. The nests are quite common in Sabino Canyon and are easy to recognize. There are typically two to four turquoise colored eggs that are incubated for 12-15 days. The altricial young leave the nest at 14-18 days. 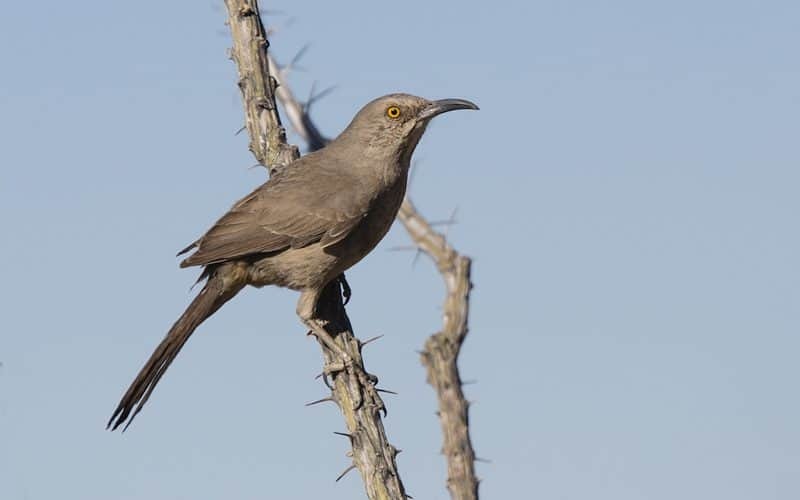 The call of the Curve-billed Thrasher is a loud, human-like whistle —Whit-Wheet — and is one of the most common bird calls heard in Sabino Canyon. Once you learn to recognize this call, you will be able to point it out to visitors on most visits to the canyon. The males sing a complex song from a conspicuous perch that includes mimicry of other species. This photograph was taken in April 2008 in lower Sabino.